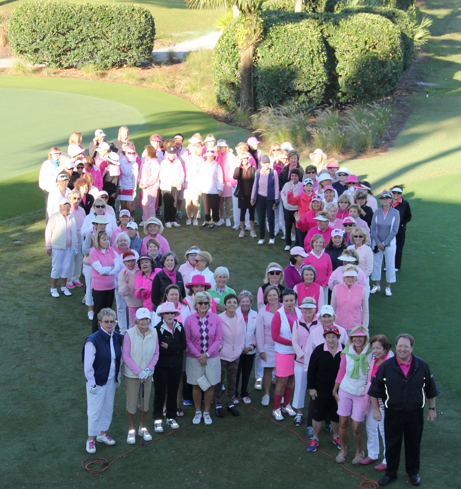 Members of The Loxahatchee Club rallied together for the 10th Annual Play For P.I.N.K. Tournament, raising $45,000 for the Breast Cancer Research Foundation. The tournament wouldn’t be possible without the enthusiasm of our members who rally together every year for this great cause. It’s a true testament to the club’s close community. The Loxahatchee Club in Jupiter, Florida, held its 10th Annual Play for P.I.N.K. Tournament on February 11, 2015. 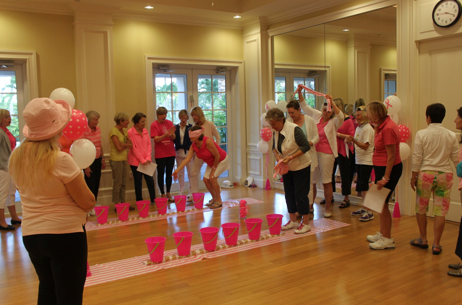 More than 100 women participated, helping to raise $45,000 for breast cancer research. Since its inception in 2006, the event has raised nearly $250,000, with 100 percent of the proceeds going directly to the Breast Cancer Research Foundation. A committee of members, headed by Mary Jo Brown, organized the event, which featured golf and a multitude of sporting events, including tennis, bocce, and majjong. The Play for P.I.N.K. tournament is just one of the philanthropic tournaments the club organizes yearly. With a focus on local community, The Loxahatchee Club hosts annual charity tournaments benefitting Jupiter Medical Center and Special Olympics Florida. Play for P.I.N.K. is a grassroots organization dedicated to raising funds to fight breast cancer through sporting and lifestyle events. Play for P.I.N.K. and the Breast Cancer Research Foundation are proud to share the same vision: Find a prevention and cure in our lifetime. Founded in 1996, Play for P.I.N.K. volunteers have raise over $38.5 million for breast cancer research. For more information, visit http://www.playforpink.org/ or http://www.bcrfcure.org/. Distinguished as a Platinum Club of America by the Club Leaders Forum and recognized as one of Golf Digest’s top courses, The Loxahatchee Club offers a superlative private club experience to residents of the Loxahatchee community and a select few non-resident and junior executive members. The club features an imaginative Jack Nicklaus designed 18-hole course, unparalleled practice facilities, and a full range of country club amenities—all complemented by superb service from an experienced, attentive staff. To learn more about The Loxahatchee Club, visit http://www.theloxahatcheeclub.org/ or contact the club’s Director of Membership Development, Gayle Mortimer, at (561) 427-1270 or gmortimer(at)loxclub(dot)com.